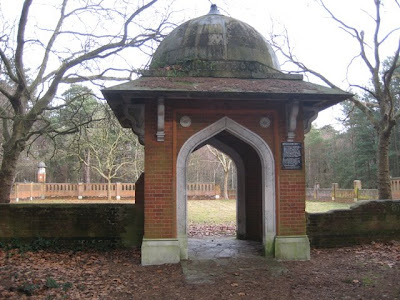 Last Sunday i was a bit bored and restless and in need of some fresh air so i decided to re-discover an old haunt of mine - The Muslim Burial Ground on Horsell Common. This disused cemetery occupies the most unlikely of locations being surrounded by trees and set well back from the main road into Woking. I used to take my chidren when they were young to this part of the common and was surprised to find this relic of Woking's past. Not many people visiting Woking are aware of it's existence or historical significance. The domed entrance to the burial ground. 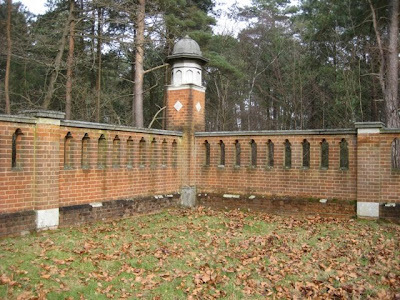 The Muslim Burial Ground was built in 1917 when many troops from the Empire were fighting in France during the First World War. The site was chosen because of it's close proximity to Britain's only mosque at that time, the Shah Jehan Mosque in Woking (more of which in my next post), and it's structure emulates many of the mosque's features, including the minarets, arches and the majestic dome. Hidden from public view by the trees of Horsell Common. Indian army soldiers wounded fighting in France during 1914-16 were treated in England in special hospitals along the south coast including the famous Brighton Pavillion. Those who died received burial rites according to their religion. There were special cremations for Hindu and Sikh soldiers. After concerns were raised that Muslim soldiers were not being buried according to their preferred religious customs - most importantly facing in the direction of Mecca, the sacred city of Islam, the War Office stepped in and purchased the site as a special burial ground. On completion, the burial ground received 19 burials of Indian Army soldiers and a further five during World War Two. The soldiers served in different regiments but most were recruited from small villages in what is now Pakistan. Part of the original wall showing the arches and corner minaret. In 1921 the War Graves Commission took over its upkeep. Local people remember it had a yellow gravel path, iron gates at the entrance and two inside seats for visitors. 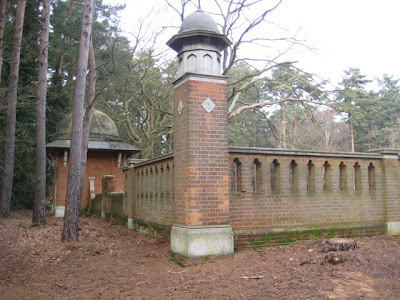 Unfortunately by the 1960's the cemetery was suffering vandalism due to its isolated location so reluctantly the decision was taken in1968 to remove the bodies to the Military Cemetery at Brookwood. Now a grade two listed building the burial ground is an overlooked memorial to the Indian Army soldiers who gave their lives during the two world conflicts. 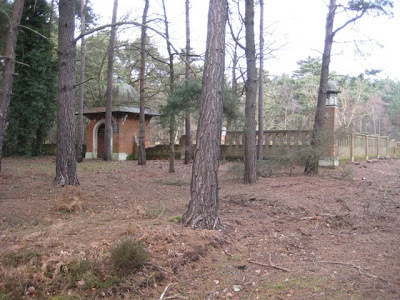 In need of much work and attention it is now under the care of Horsell Common Preservation Society which is working with Woking Borough Council and the local Muslim community to find ways of funding its restoration and preservation. Lets hope they succeed. Fascinating article! I remember reading that it was Rudyard Kipling who designed the gravestones for First World War Soldiers, including the different ones for different faiths. Followed you here from your comment on my history of england blog, and very glad I did so. Gosh, this is an absolutely fascinating post! In a sense, it is good that the bodies are in a military cemetary but it is a pity they had to move them. Really enjoyed your post. There is something super nostalgic about touring a cemetery. My wife is not quite as fond of it as me!